Considering becoming a member? At Albany UU, we always welcome new members who are looking for opportunities for personal growth and development, as well as ways to serve. We invite you to join our warm and loving community. 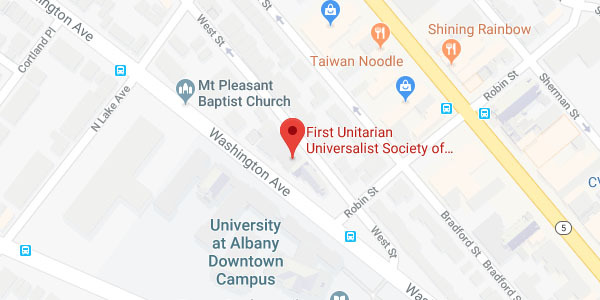 Everything you see and experience at Albany UU, meaningful services, lifespan learning, religious education for youth that inspires and challenges, social action to transform local communities and the world, is built on a foundation created and supported by our congregants. As a member, it is each person’s responsibility to carry forward this legacy by being present, participating, and pledging. Being Present: taking an active part in the life of the Albany UU community. Participating: sharing your time and skills through volunteer opportunities. Pledging: giving monetary support for the work of the congregation at a level that makes you feel good. A member does all of this and more. Membership implies your commitment to make this religious community all it can be: a gift to yourself, your fellow congregants today, and those to come. As our community nourishes and enriches your life, we hope you consider becoming a member of Albany UU. Sign an Intent to Join form to let us know you are interested! Getting to Know UU is held on Saturday mornings, about four times a year. This is required of all new to Unitarian Universalism, and is suggested for UUs from elsewhere. Enjoy some time with Rev. Sam Trumbore. He would love to hear more about your journey in life so far, and how you see your connection with this congregation as being part of your explorations. You already have skills; find out in what roles Albany UU needs you. Read our section on Getting Involved to learn about how to become engaged in our community. Read our section on Giving and learn how a small donation from someone with limited income or with significant financial obligations can be more generous than a large donation from someone who is financially well-off. Meet with someone from the Stewardship Committee and make your first pledge. When you have completed the above steps, the Welcome Team leader will set up a date with you to sign the book. The signing will be done privately in the minister’s office. You will receive a packet of useful information for members, and we’ll take your photograph. You’ll be asked to write a short bio also, for the purpose of introducing you to the congregation. New members are officially welcomed into the congregation during the Sunday service three or four times a year. New members, their children and any invited family will have reserved seats in the front. Your children are welcome to accompany you on the stage for the ceremony. During the ceremony, the congregation president will introduce you and read your bios. After the service, you and your family are invited to a reception. The same bios, as well as your photo, will be printed in the monthly newsletter all in the interest of making connections among the congregation. Receive a 50% discount on church space rentals.